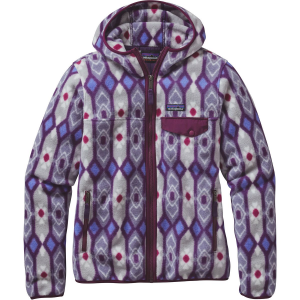 When you’re relaxing by the fire or napping on the train, it helps to be cozy inside the Patagonia Women’s Lightweight Snap-T Fleece Hooded Jacket. With a double-faced construction of polyester fleece with spandex trim, this soft jacket traps body heat against light winds and daily use. It also features zip handwarmer pockets and a snap chest pocket.